Reading every day, especially if your reading consists of challenging and varied material and you use a dictionary actively and habitually, is a good long-term way to expand your vocabulary. Regular writing practice allows you to become more comfortable with the broader vocabulary that your reading exposes you to. But I firmly believe in the value of systematic study of new words using well-designed and informative materials. Anyone interested in becoming a better reader, a better writer, a better communicator in general, and even a better thinker should consider using vocabulary materials like the ones I have my students use. The following books are high-quality books for vocabulary building that I have used with my students for many years. The last two books below can be hard to find, so feel free to contact me to see if I have extra copies available. I’ve also made audio recordings of many of the lists that I would be happy to share. The Wordly Wise 3000 series of books provides an effective long-term course of study, with helpful exercises, appropriate usage examples, and informative passages about a wide variety of topics that incorporate the words. The vocabulary lists on my Quizlet page are based on the Second Edition of the books, but as far as I know the word lists are the same in each edition. (Note that the numbering system for the First Edition books is not based on grade level, as it is in later editions. In other words, in the newer numbering system, the words in Book 8 are more or less appropriate for 8th graders, though they may be too advanced for some.) See the links elsewhere on this page to Quizlet lists for several of the books. Many other Wordly Wise lists have been made available by other Quizlet users, so if you do a search for the specific list you want, you’ll probably find it. Depending on their vocabulary level, many of my students in 8th-10th grades use Vocabulary for the High School Student (“VHSS“), which organizes words into groups according to various criteria such as related meanings, Latin roots and prefixes, and Greek word elements. Although it is not a perfect book, I like it because it is well organized, thorough, and replete with usage examples and exercises. Unfortunately, it does not contain an answer key for its exercises, and as far as I can tell the publisher has not made one available, so I have created my own answer key. If you are a teacher or parent, please contact me for a free PDF copy of my answer key. I can’t give it out to students whose teachers may not want them to have it. You can also study the words for the entire book in my VHSS Quizlet folder. 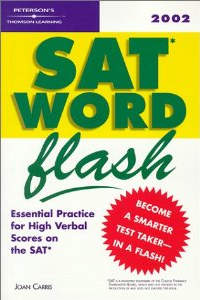 My more advanced students use an out-of-print book called SAT Word Flash (“SATWF“), known as In-a-Flash Vocabulary in later editions, which contains a well-designed and well-chosen SAT vocabulary curriculum and can be studied a little more quickly than VHSS. Because it is out of print, unused copies can be difficult to find and are usually absurdly expensive even if you can find one, so feel free to contact me to see if I have any extra copies. 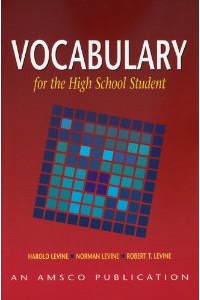 Although extensive vocabulary knowledge has been de-emphasized on the most recent version of the SAT (with the removal of sentence completion questions and a focus on secondary meanings of more commonly used words), I still think this book is a great way to prepare for college-level vocabulary. College students, as well as anyone who reads extensively, will encounter the words in this book and should strive to incorporate them into their writing—these words are not obscure, esoteric, or useless. All of the lists from this book are available to study in my SATWF Quizlet folder. I have entered numerous vocabulary lists from the books above into my Quizlet account to facilitate studying. Quizlet is an extremely useful study tool that allows you to create your own flash cards (or study other people’s), play games with the terms you’re studying, and test yourself, and it keeps track of your performance as you study. I highly recommend giving it a try, especially for those who struggle with traditional methods of memorization. You can sign up for a free account on the main page to enable some features—registration is quick and easy and can be done with a Google or Facebook account. Keep in mind that rote memorization of definitions is of limited benefit without exposure to the actual usage of the words or practice in applying them. I strongly recommend making use of the examples and exercises in the books above instead of relying on Quizlet alone. Your understanding of the words will be much deeper if you use the books in conjunction with Quizlet. You can use Quizlet for free without an account, but signing up for a free account will enable you to use a lot of additional features. You can sign up on the main page.